The company is positioning itself for future growth but faces near-term earnings headwinds. Here's why the stock is a good long-term value. United Technologies' (NYSE:UTX) management believes its stock is undervalued, and given the merger discussions earlier in the year, it's likely that Honeywell International's (NYSE:HON) leadership feels the same way. The question is, should investors feel the same? Here's what you need to know before making an investment in United Technologies stock. OTIS HOPES DEMAND FOR ELEVATORS WILL IMPROVE. IMAGE SOURCE: GETTY IMAGES. The answer is likely to be contingent on your patience level as an investor. Simply put, United Technologies does look like a good value. But here's the rub: The improvements the company is currently making won't show up in the usual headline metrics -- earnings and free-cash-flow growth -- for a few years. The following chart shows analysts' forecasts for EPS in the next few years. For reference, the forecast compound annual growth rate from 2015 to 2018 is a paltry-looking 4.7%. DATA SOURCE:NASDAQ.COM. CHART BY AUTHOR. With such an anemic-looking growth rate ahead, why would you want to own the stock? The reason is the company is going through a transitional phase, and in doing so it's laying the groundwork for long-term profit and cash-flow growth. In a nutshell, the company is suffering short-term pain for long-term gain in three of its four operating segments: Otis, aerospace systems, and Pratt & Whitney. The odd one out is climate, controls, and security. The company is cutting Otis' new equipment prices in China to win market share and generate long-term services income -- the latter tends to be higher-margin. Aerospace systems is seeing a shift in the sales mix toward newer aircraft from legacy planes, creating a profit shortfall, as the former tends to be lower-margin, at least initially. Otis will have a secure stream of services revenue from the new elevators sold. Pratt & Whitney will reduce cost per engine as it ramps up production of the geared turbofan and in the long term will see strong aftermarket revenue, particularly as management aims for fleet-management program coverage. By now, investors might see that there's a case for ignoring the short-term trends of the market and just buying the stock. After all, the stock currently trades at a noticeable discount to its peers. 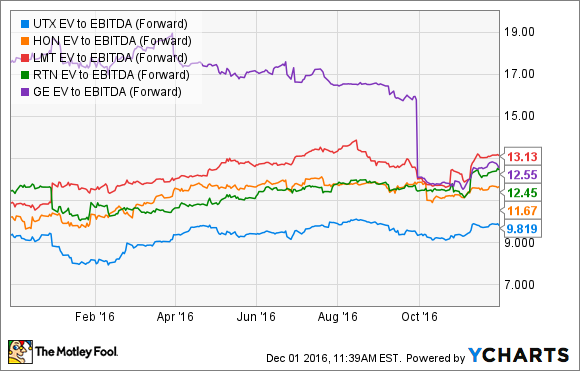 UTX EV to EBITDA (Forward) data source: YCharts. The question now turns to how the company is executing on its plans. Surveying the recent third-quarter results, CFO Akhil Johri outlined on the earnings call how, in aerospace systems, "the adverse mix would be ... the biggest headwind in 2017" and added, "It starts to become better from 2018 onward." Meanwhile, Otis unit orders were up 3% in the past three quarters, where Johri said "we firmly believe the market has been down 5% or more," although it's worth noting that on a sales basis, Otis' new equipment orders were down 10% in the third quarter because of the pricing actions. See what I mean about short-term pain? Pratt & Whitney has certainly had issues with ramping up production on the engine this year. Management originally planned to produce 200 geared turbofans in 2016, but production difficulties have seen the target reduced to 150. Well-documented difficulties with fan blades have caused concerns, but CEO Greg Hayes sought to allay fears by pointing out how the "total lead time," from production to approval through a test process, had been reduced from around 100 days at the start of the year to 55 days at present. That said, Johri expects negative engine margin in 2017 to "increase by over $300 million year over year from approximately $650 million in 2016," with an additional $100 million in 2018, ultimately leveling off at around $1 billion. UNITED TECHNOLOGIES' GEARED TURBOFAN ENGINE. IMAGE SOURCE: UNITED TECHNOLOGIES. All told, United Technologies faces earnings headwinds in the next couple of years, and you will need to be patient before the fruits of management's current work starts showing up in the headline numbers. Then again, by definition, long-term investing requires a long-term perspective, and in that regard, United Technologies is a good investment right now.